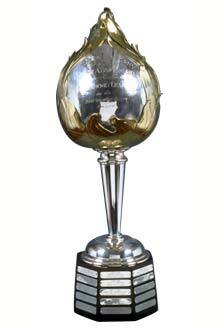 The Hart Memorial Trophy was presented to the National Hockey League in 1923 by Dr. David Hart. Dr. Hart was the father of Cecil Hart, the former coach and manager of the Montreal Canadiens. Cecil Hart coached the Canadiens between 1926-27 and 1938-39, winning back-to-back Stanley Cup championships in 1930 and 1931. The trophy is presented to the most valuable player in the National Hockey League during the regular season. Voting is conducted by the members of the Professional Hockey Writers' Association. The initial winner was Frank Nighbor of the Ottawa Senators, awarded the Hart at the conclusion of the 1923-24 season. Wayne Gretzky has collected the most Harts-nine in total, with eight from his days as an Edmonton Oiler and one as a King in Los Angeles. Leading winners: Wayne Gretzky (9), Gordie Howe (6), Eddie Shore (4).